A multi-year College and Career Readiness survey reported that less than half of high school students felt positively about their college and career readiness, a statistic that is likely unsurprising to anyone familiar with teenagers. Life after high school can seem daunting and uncertain, with so many options and no clear idea about how interests can align into careers. That’s where Unmanned Safety Institute comes in, providing career training that can be used as credit in college or as experience directly in the workforce, not just in one industry, but in many. The Unmanned Safety Institute has guided thousands of students across the country through the Small UAS Safety Certificate™ CTE program, a four course curriculum designed for high schools and post-secondary education institutions that teaches students not just about the technology of small unmanned aerial systems (sUAS), but about the aeronautical principles, safety practices and professional requirements that are critical for professional pilots to understand in order to stand out in the field of remote pilot operations, a field that is becoming increasingly crowded. The students that elect to participate in the program come from a variety of backgrounds, with a variety of skills and ideas for the future. Although some choose to pursue a career that doesn’t involve UAS technology, many decide to follow a route that combines their fascination with the ever-evolving technology, with a current interest, like one Florida student with a passion for law. In 2017, high school senior Rachel Driver learned that her school was offering a new program specializing in a technology that was making rapid advancements in the Law Enforcement industry and she knew that she had to participate. “Loving the technology and the law fields, I thought unmanned systems would be great to do and I was looking forward to the advancement of UAS capabilities of all the possible applications. 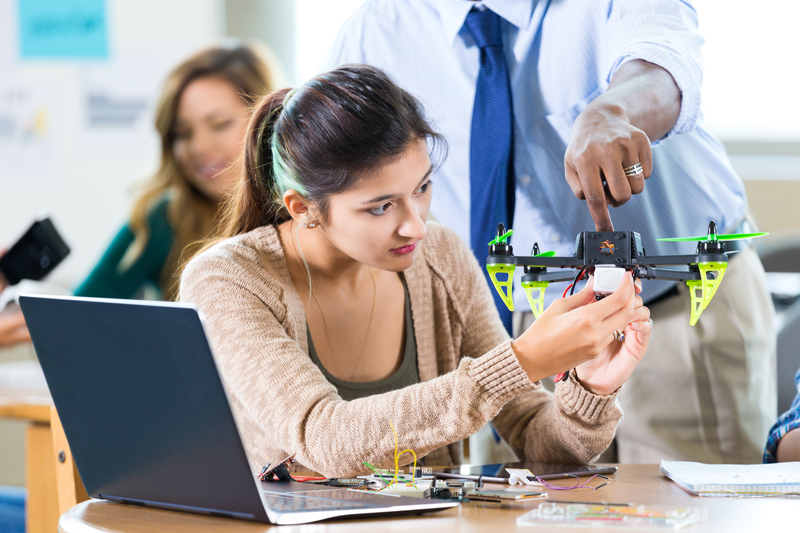 You look out now and see people are using these small machines to inspect things, help with their crops, or even drone racing,” said Rachel when asked about why she chose to join the class. Rachel was one of the first students to enroll in the Small UAS Safety Certification course at Newberry High School in Florida and studied under Patrick Treese, The Director at the Academy of Criminal Justice and the criminal justice teacher at the high school whose principal tasked him with finding an industry certification that worked for the school. He did some research and found that USI’s program was cost-effective, industry-recognized, and most importantly, attainable for his students. Treese was familiar with the advances the new technology was making in the law enforcement industry and recognized a need for his students to gain a new and in-demand skill-set, especially since he was seeing UAS used by emergency management and law enforcement in his own county. Rachel’s enthusiasm for the technology and her success in the course led her to Embry-Riddle Aeronautical University, where she is currently majoring in Unmanned Aircraft Systems (UAS), participating in the UAS Club, and flying her UAS under her Part 107 Remote Pilot Certification. Although Rachel doesn’t know exactly what her future will be, she knows it will involve unmanned aerial vehicles. When Taylor Wager started his senior year at Harbor Springs High School in Michigan, he, like many high school seniors, was unsure of his post-graduate plans. His senior year happened to coincide with the first year that Harbor Springs High School would implement USI’s Small UAS Safety Certificate program, led by science teacher and unmanned enthusiast Robert LaPoint, who saw the potential in unmanned aerial vehicles (UAVs) and recognized the value of a program that would train students for a career using the technology. It was in this class that Taylor, with the guidance of Mr. LaPoint, “took to UAV's like a duck does to water”, as Jim Rummer, Director of Career & Technical Education for Char-Em ISD stated. Taylor dove into the class, embraced the workforce style training, and quickly became focused on the technology and potential for a career using UAVs. Where before he had no concrete plans for life after high-school, his experience in the class prompted him to continue on an unmanned career path, straight to Northwestern Michigan College UAS instructor, Carl Rocheleau. Taylor is now in a third-level UAS class at NMC and learning about laws and regulations, operating a variety of drone platforms, advancing flight capabilities, and applying different electrical components to a drone. “The main reason I chose to take the sUAS Safety Certificate course at Harbor Springs high school is because of Robert LaPoint. My senior year I was really looking for what I wanted to do in life and I was talking to Mr. LaPoint about different opportunities and he said that I should take the USI class. 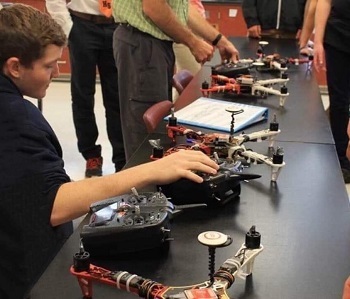 Before the class I had never flown a drone and I wasn’t very interested in them, but I followed Mr. LaPoint’s advice, took the class and I realized about halfway through the trimester that this is what I wanted to do for a career,” said Taylor. Taylor stated that what he found most helpful about the class was that the content covered a wide range of topics, which he believes gave him an edge when he took the Part 107 exam to become a commercial remote pilot and, in his studies, when he started UAS classes at NMC. Taylor’s passion for unmanned systems is not just limited to the traditional classroom. He has been asked by Char-Em ISD to teach an ROV class for their "Career Academy for Kids" camp this summer, sharing his enthusiasm for UAS with younger students. Taylor is currently finishing up his first year at NMC and plans to continue studying unmanned aerial systems as part of NMC’s aviation program, where a UAS training center facilitates specialized instruction to support the growing industry. USI’s Small UAS Safety Certification delivers content that can be applied to any industry using unmanned technology, a list that is constantly growing as the technology advances. Covering the four key themes that all remote pilots need to understand – Unmanned Aircraft System Foundations, Unmanned Aircraft System Applications, Remote Pilot Personnel, and UAS Safety Management – the program is designed to be flexible and meet the unique needs of every educational institution and their students. Instructors, certified by the Unmanned Safety Institute, strive to meet USI’s company-wide goal: to promote flight safety and professionalism through continuous learning. To date, more than 5,000 students have enrolled into the program which has been approved by several State Departments of Education and has been recommended for college credit by the American Council on Education. The program has scaled from 30 high schools in one state in 2015 and is currently being taught in more than 150 schools across 25 states and will be implemented in more educational institutions for the 2019-2020 year. USI is widely recognized as the global leader in UAS education and training standards and safety certification delivering the most highly-regarded training programs in the industry. USI delivers turn-key UAS technical education and training programs now being offered in hundreds of flight training institutions, high schools, community colleges, and four-year universities around the country. USI is endorsed by major aviation insurance providers, supports aviation flight departments worldwide with unmanned programs, supports career pathway initiatives with industry leading safety programs, and delivers training programs evaluated and recommended for college credit by the American Council on Education (ACE). USI’s coursework is accepted by the FAA Safety Team for Wings Credit. Discover more about the Unmanned Safety Institute atwww.UnmannedSafetyInstitute.org.